As much as I like Alleluia, there comes a time when it just gets a bit boring, not to mention nothing really to blog about! That is the case with the Saturday hockey group. I am no longer a regular with this pickup hockey. I only make it out a few times a year as a sub. Of course I love the fact they go out to eat afterwards; but it's Alleluia or bust with these guys. Much like the time I coerced them into going to Silver Tower, I suggested we do something different again. 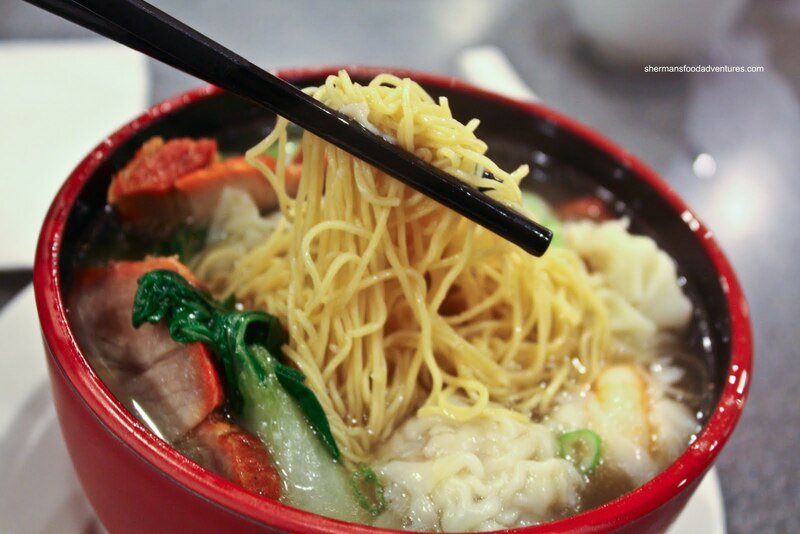 For me, the most interesting place to try was Taste Good Wonton, formerly Wonton King. Interesting you might ask? Considering there is a massive sinkhole th e size of Wesley Snipe's back taxes in front of the restaurant, I would call that more than interesting. The only way into the parking lot at this moment is to drive in the opposite direction on Marine Drive from Fraser. I can only imagine how this is affecting business. When we approached the door and tried to open it, we found it to be locked. I suppose that the restaurant is taking precautions against robberies or shootings? I did intend to shoot; but with my camera of course. Well, they opened up and let us in. I guess we don't look very threatening after all. Strangely, the lone server gave us the dinner menu which did not list any wontons whatsoever. 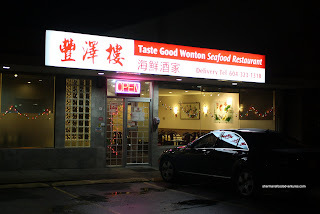 The place is called Taste Good Wonton right? I resorted to snatching a takeout menu to see the available wonton noodles and congee. So guess what I ordered? Duh. Wonton Soup. And did they taste good??? Well, they did taste alright; yet I would hardly say they were good. Made of half pork and half shrimp, the wontons were overly chewy for me. The pork was a tad too chewy and the shrimp were overcooked. The soup base itself was on the lighter side lacking depth. Max Pow er decided on the classic Preserved Egg & Salted Pork Congee. The best way to describe the effort here is acceptable. 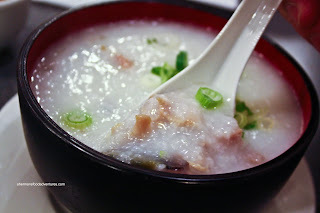 The congee itself wasn't exactly thin; yet it wasn't that thick either. Depending on personal tastes, the congee was either underseasoned or just right. Lastly, there was a decent amount of salted pork and duck egg. Mr. Vain had the BBQ Pork and Wonton Noodles. He gave me a sample of the noodles and they weren't half-bad being slightly chewy. 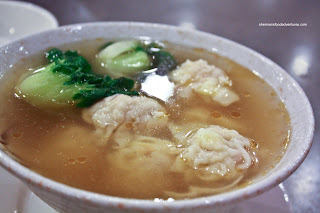 Of course, these were the same wontons and broth, so nothing new to report about that. Crazy Goa lie had almost the same noodles except with BBQ Duck instead of BBQ Pork. Probably since we were there near closing time, the BBQ'd items were pretty dry. I wouldn't hold that against them as such then. Chunkylover73 ended up with what he always orders - Brisket & Flat Rice Noodles. Too bad they ran out of flat rice noodles; hence he had to get wonton noodles as as well (with brisket). 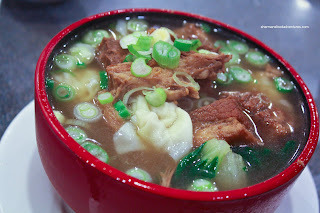 Same story with the soup, noodles and wontons while the brisket wasn't bad. It had a good amount of fat though. Lastly, I wouldn't just come here and have the wontons alone... So I added an order of the Salted Fish & Chicken Fried Rice. Hey, this was pretty good. 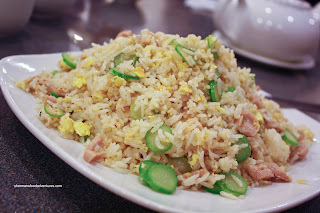 There was a good amount of tender chicken, moist salted fish nestled in nicely fried rice. The rice had a bit of bite while not being too dry either. Lots of salted fish taste and good "wok hay". That was a pretty good finish to an otherwise pretty average meal. Of course we shouldn't expect much at 2:00am; but when a restaurant is named "Taste Good Wonton", the wontons better be good. Alas, these were not.